Speaking of stop motion animation, my son, who is three and a half years old, has recently discovered the stop motion masterpieces of the late Ray Harryhausen: Jason and the Argonauts, The Golden Voyage of Sinbad, Clash of the Titans. 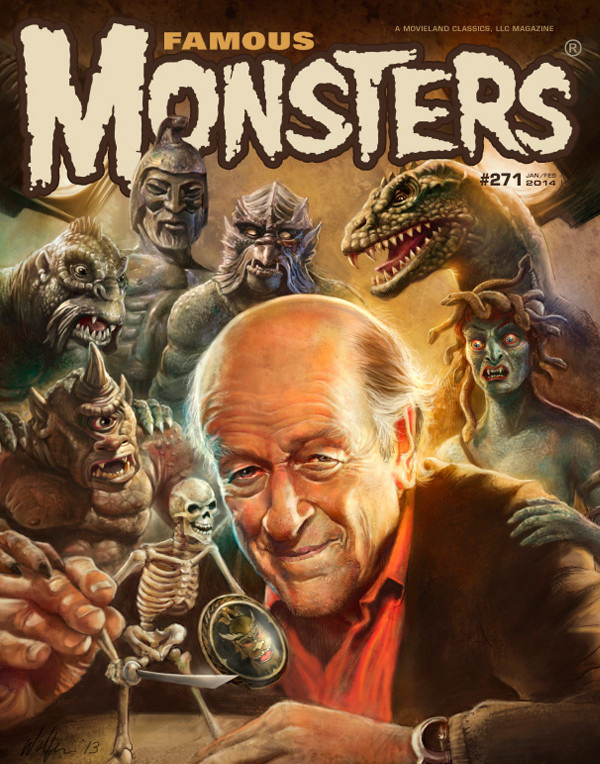 I had purchased a tribute issue of Famous Monsters with some of Harryhausen’s iconic creations on the cover, and my son started asking about them. I explained the technique of stop motion animation—taking hundreds, sometimes thousands of successive pictures of slightly adjusted models, creating the illusion of motion when projected in sequence—always being clear that they were models, like toys, not real. As fascinated as he is by monsters—he’s a boy, after all, and before Harryhausen he was curious about the Godzilla movies I had lying around, and of course we have lots of discussions about dinosaurs—I wanted to make sure he could draw a distinction between creatures of fantasy like the Kraken and real but extinct animals like Tyrannosaurus rex. Overprotective? Perhaps, but I remember being kept awake at night by fears of the giant ants from Them!, and at an older age than my son is now. 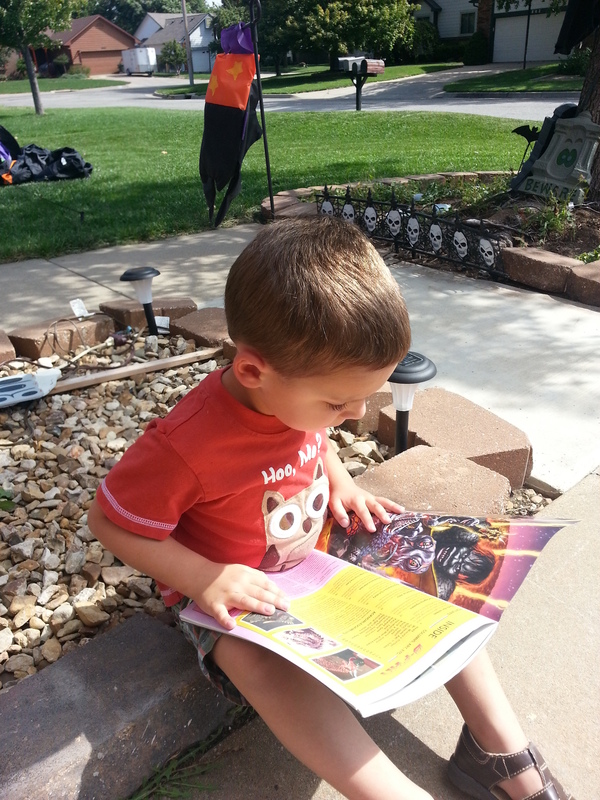 If I give him nightmares, I’ll hear about it from his mother. From my explanation it was a short leap to hunting for clips on YouTube and the excellent documentary Ray Harryhausen: Special Effects Titan on Netflix, which explained Harryhausen’s methods better than I could and held my son’s attention for a good twenty to thirty minutes at a stretch (the documentary is feature-length: we watched it in installments). For a few weeks after, my son would ask about the “model movies” and we would watch a scene or two from Clash of the Titans, the only Harryhausen movie I have on disc. 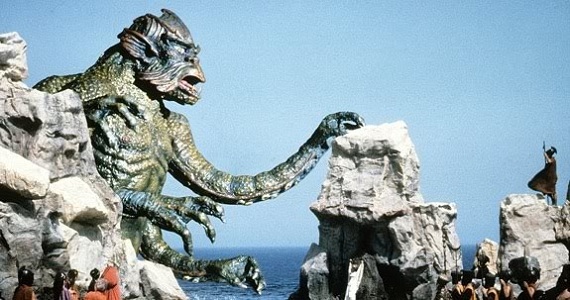 Harryhausen is nostalgic to me for a few reasons. I remember seeing Clash of the Titans when it was new in 1981, at the downtown movie palace that would close a few years later, replaced by the four-screen “multiplex” at the mall. The mythological references went over my head, but I’ll never forget the terrifying and fascinating Medusa and its gruesome death scene. Even more than that memory, I associate Harryhausen with holidays: most of his movies I saw on television during Thanksgiving or Christmas breaks, probably counterprogrammed against football games in those days when cable TV meant having a few dozen channels instead of hundreds. I’ve previously indicated my obsession with animation and effects as a kid. Any time there was a behind-the-scenes show about movie special effects, I was there. The best parts of these shows were often clips of other projects the filmmakers had a hand in, the kind of thing that was unlikely to show up on TV by itself. For example, I knew who Phil Tippett was because of his involvement with Star Wars and the big special effects movies that followed in the 1980s, but I was never able to get more than a glimpse of personal projects like Prehistoric Beast, from 1984. Unless they were part of a film festival showing or I was lucky enough to catch them on Night Flight or MTV, there wasn’t much I could do to track them down in those days. A number of speakers in the Special Effects Titan documentary comment on stop motion’s “dreamlike” quality. That’s a polite way of saying it doesn’t look real, but realism wasn’t exactly the point. To my knowledge, Harryhausen never proposed replacing human actors with stop motion likenesses in the same way computer graphics have been put forward as a “fix” for aging actors or a replacement for the long-dead. There is something mysterious about the sometimes-jerky movements of stop motion; even when done by a master like Harryhausen, it has a certain distinctive “look.” Along with other film tricks like rear projection and altered film speed, the ratcheted movements of stop motion are burned into my mind as a filmic style that isn’t “real” but is aesthetically gripping. As a less obvious example, Dragonslayer’s composite landscapes, with their fast-rushing clouds, heightened lighting, and blend of full-size and miniature models, are just as artificial as the computer-assembled Middle Earth of Peter Jackson’s Lord of the Rings adaptations, but I still cherish them. Perhaps it’s simply the density of elements that are brought together that grabs me. I don’t hold that traditional stop motion is superior to computer graphic animation because of its difficult and time-consuming nature: that line of thinking is to my mind a moral rather than an aesthetic argument. The goal of either technique should be involvement in the story rather than calling attention to itself. If we accept the premise that film—all film, from The Great Train Robbery forward—contains shifts of viewpoint that were once associated with either dreams or godlike omniscience—the ability to jump from one point in space to another, to cut between views—then CG’s ability to create images purely from light and numbers represents the culmination of cinema’s potential: it is of a piece with all effects work that has come before. If cinema would continue to be vital, why cut off any avenue of development? Of course CG is understandably used to save time and money, and sometimes by filmmakers who have more of both than they have imagination. If anything it’s the low barrier to entry that has given CG such a bad rap; nevertheless, a bad film is a bad film. I will say I prefer practical effects for their sense of heft and reality in space, and I appreciate the level of craftsmanship and dedication that handmade filmmaking shows off, but I wouldn’t deny that those can be qualities of CG. Perhaps the joy of practical effects work is in the ingenuity with which filmmakers solved problems; it could be the “personal touch,” sensing the involvement of an animator handling a model (like the marks left in King Kong’s fur by Willis O’Brien) or dragging a brush across a cel. Ultimately the effectiveness of special effects lies not only in their execution but in how they are used—how effects shots are framed, how they are built up to and cut away from through editing, and their function within the story. Jurassic Park, still a landmark of CG effects after more than twenty years, looks better than many CG films made last year simply because of the care with which Steven Spielberg and his crew combined CG with models and other practical effects, edited seamlessly together to create an illusion of reality. Conversely, a carelessly executed effect will look crummy and take the viewer out of the film whether it’s CG or practical. One reason traditional stop motion looks eerie compare to actual moving objects on film is the uncanny clarity of each frame: when live motion is filmed, there’s a slight blur as the actor or object is caught in motion while the shutter is open. Animators have ways of getting around that (even in hand-drawn animation), introducing more naturalistic blur after the effect (or even in-camera, through a process dubbed “go motion”). Nowadays, CG can be used to smooth out the inconsistencies and simulate the blur of motion even when models are still animated by hand (such films as Coraline and Paranorman are examples of this hybrid style). As it happens, The Lego Movie, which I wrote about enthusiastically last time, is animated almost completely in CG rather than stop motion, but the constraints of animating a world made (almost) completely out of Lego bricks lead to some interesting results. In an interview with fxguide, CG Supervisor Aidan Sarsfield of Animal Logic (the studio that animated The Lego Movie) spoke of the filmmakers’ desire to “stay true to the medium” of Lego, treating it very much as if it were a stop motion film on a real Lego set (albeit one of huge scale and complexity). The CG bricks were treated as rigid: there was no stretching or distortion, and the only movement was at points of articulation. Even effects that are generally ephemeral or subject to fading (such as flames, laser beams, smoke, explosions, and moving water) were virtually “built” out of bricks or other Lego pieces, which were “binary”—either there or not there. Sarsfield describes the process by which colors or brick sizes could be cycled through to give the impression of fading clouds of smoke or moving waves; the effect is unlike anything I’ve seen, and more to the point most of it could by recreated in actual bricks and animated by hand (even though it would probably take forever). Brick blur was created by a little strip of bricks. The colors of the character matched the string of bricks but the silhouette was defined as if someone has structured the motion blur with bricks. I previously mentioned how much I enjoy the abstraction of animation, especially stop motion. In this case, the squared-off forms of Lego bricks and minifigures are matched perfectly by the jumpy, ratcheted motion of the animation style. (It’s worth noting that the Lego characters’ faces are smoothly animated—there are limits to abstraction, after all.) Subtleties like “brick blur” and the audacity of (for example) an entire surging sea made of constantly shifting Lego bricks are great examples of filmmakers exploiting the unique aspects of their medium to create something truly novel; and the end result shows how computers can be used without losing the handmade qualities that made the project appealing in the first place. Aidan Sarsfield mentions that the animators knew they had been successful when the first trailers appeared and audiences couldn’t tell whether stop motion or CG had been used; I wouldn’t be surprised if The Lego Movie inspires another generation of animators and model makers.